I use spinach (Spinacia oleracea) and Swish chard (Beta vulgaris ssp. cicla), interchangeably, for cooking, although they belong to different species. Spinach has a high nutritional value, is extremely rich in antioxidants, especially when fresh, steamed, or quickly boiled. It has vitamins A, C, E, K and many micronutrients like magnesium, iron and potassium. There are three cultivars of spinach: the flat-or-smooth leaf spinach: this is the most popular variety, with smooth leaves, sold in most supermarkets and salad bars, mainly as baby spinach. It’s also sold canned or frozen and used in soups, baby foods and processed foods. It’s best eaten raw or quickly blanched. Savoy spinach (also known as curly leaf): has dark green, crinkly and curly leaves, and is usually sold in fresh bunches, in supermarkets. ‘Baby savoy’ can be used for fresh salads, sandwiches, dips and quiches. Semi savoy: has slightly crinkled leaves, so if you don’t like the challenging task of cleaning the crinkly savoy spinach, then this is perfect for you. It’s a hybrid between the flat leaf and curly leaf spinach. 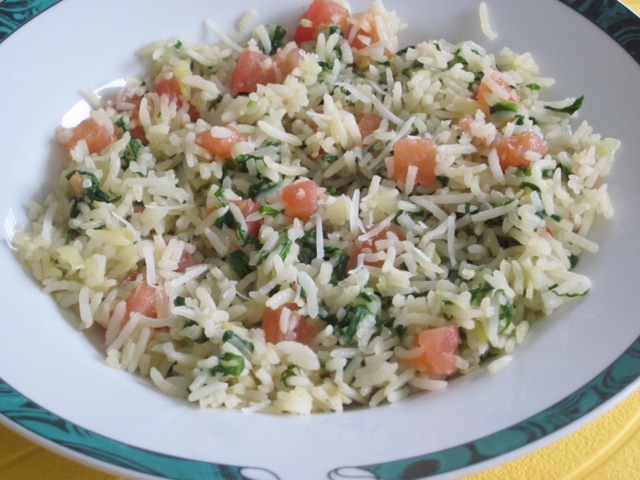 The addition of spinach, Parmesan and a splash of tomatoes to the basmati rice gave it an excellent combination of flavours. I ate the rice for lunch and topped it up with fresh fruit, as a dessert. It was awesome. I actually contemplated becoming a vegetarian. If you like cheese and spinach, please do not hesitate to try this recipe. You won’t regret it. I wish you a very pleasant day or evening wherever you are! 200g (½ Ib, 7oz) spinach, shredded (4 cups fully packed shredded spinach) I used Swiss chard. Heat butter and olive oil in a non-stick pot. Add rice and stir and fry for about 5 minutes until fully coated with oil. Add the stock, season, if necessary, and bring to a rolling boil, reduce heat and simmer for 12 minutes without lifting the lid. Turn off the heat and let stand for 10 minutes, without lifting the lid. During the 10 minutes standing time heat the extra olive oil in a different pot. Add onions, garlic and chilli flakes or chilli, if using and fry gently until soft (5-6 minutes). Pour the spinach over rice and fluff the together with the rice. Serve, immediately. (I love Parmesan, so I topped with more Parmesan. at the fluffing stage. Suit your palate). The rice tasted really good. 200g (½ Ib, 7oz) spinach, shredded (4 cups fully packed shredded spinach)- I used Swiss chard. 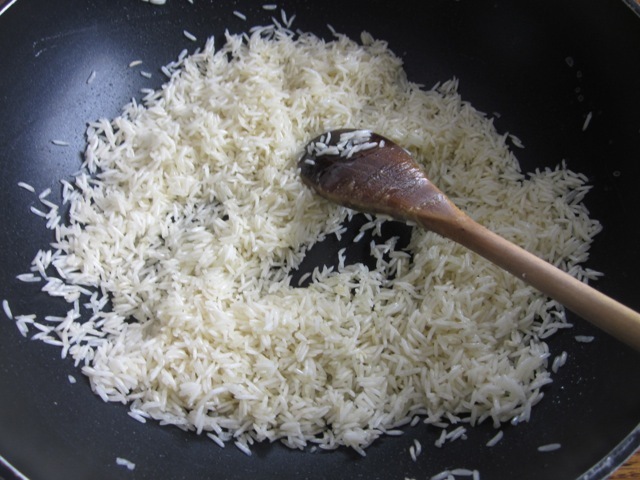 Wash and soak rice for 30 minutes and drain thoroughly. Heat butter and olive oil in a non-stick pot. Add rice and stir and fry for about 5 minutes until fully coated with oil. Add the stock, season, if necessary, and bring to a rolling boil, reduce heat and simmer for 12 minutes without lifting the lid. Turn off the heat and let stand for 10 minutes, without lifting the lid. During the 10 minutes standing time heat the extra olive oil in a different pot. 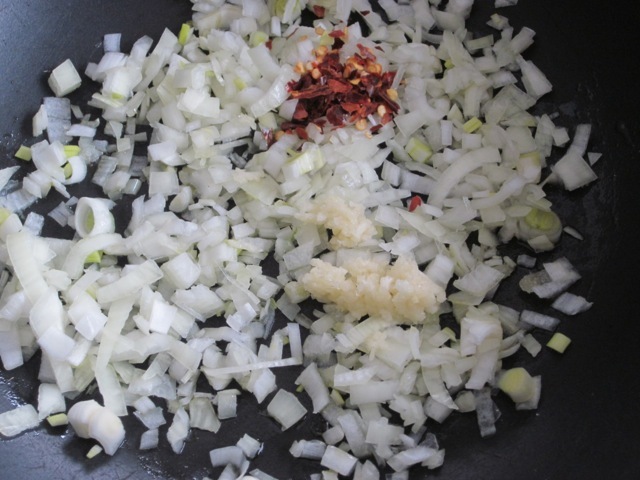 Add onions, garlic and chilli flakes or chilli, if using and fry gently until soft (5-6 minutes). 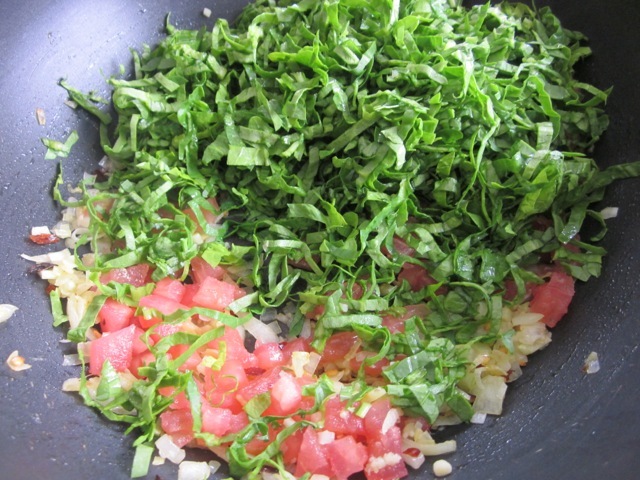 Add tomatoes and spinach and cook until spinach is just wilted (2-4 minutes). Season. 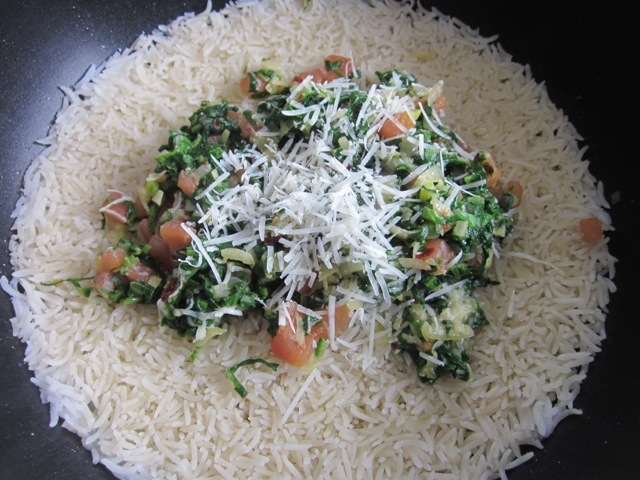 Stir in the grated Parmesan, pour over rice and fluff the together with the rice. Serve, immediately as a side meal. Please note: that I made only one cup rice for blog purposes. Also I had a lot of left over Swiss chard, which I used instead of spinach. Any favourite green veggie will do! Hi Liz, this is owesome. My food nerves get ticked at the sight of the Mozzarella pasta and meat balls recipe. A great finger licking meal for a dinner. Great cooking !!! I finally managed to sit down and respond to my messages. Thanks for complimenting the food!!! I love the mozzarella salad. it’s great for a lazy lunch. Have a wonderful weekend! Thank you, Afra. Parmesan and basmati is a great hit! Best wishes! Me too. Love rice….best wishes! Oh Yeah – this is a keeper! 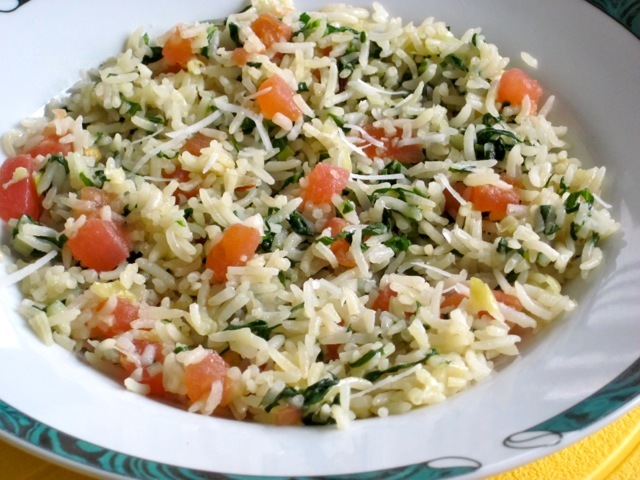 I can picture myself having a bowl of leftover rice/spinach/cheese combo for breakfast! Haha it’s simple but tasted really nice. 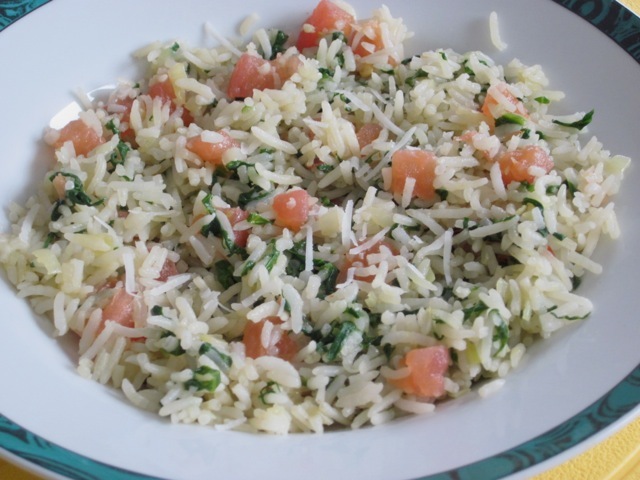 One of my favourite rice recipes! Have a pleasant day! Thank you, Aruna. I saw some really delicious rice recipes on your blog! What a delicious idea. I never think about rice as a dish on its own, but this sounds like lunch to me! Thank you. This rice, was a keeper! I would make it again, any day! Thank you. Have a pleasant day! Looks yummy! 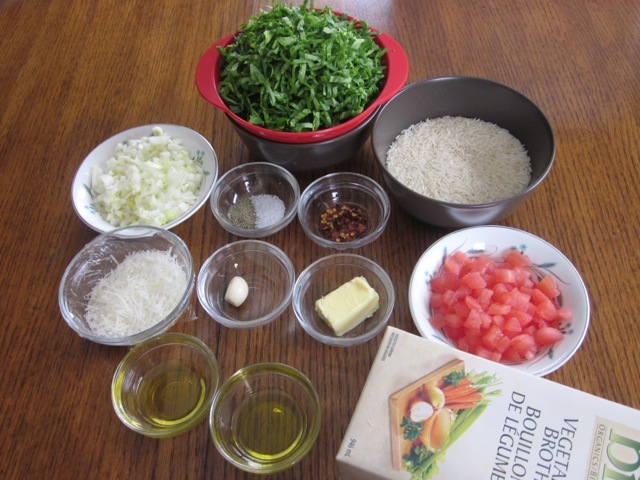 A sad rice story- I have even made risotto with basmati, but it was terrible. So difficult to get arborio here! I have made risotto with basmati and it was okay. We have all the arborio one might want to buy, it cost much more than basmati though. Have a great week! 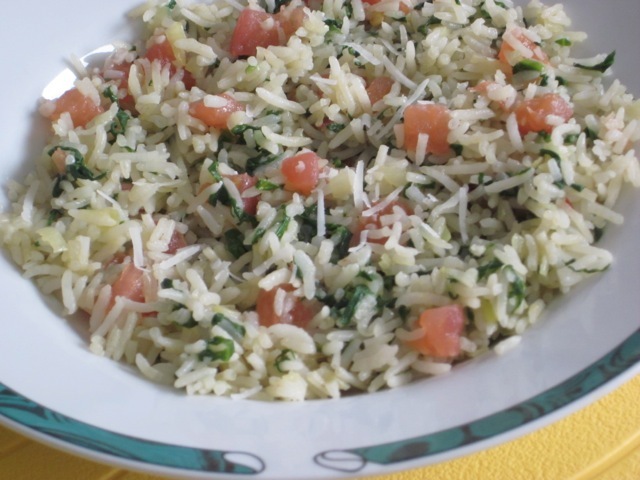 Another yummy looking rice recipe! Great spring and summer flavors with the Swiss chars and tomatoes. Thank you. I really enjoyed eating it. I saw your garden. Wow. I wish I was your neighbour! I’ll just have to send you virtual vegetables! Much appreciated. That will be some nice ripe virtual strawberries for me. Enjoy the evening! I never had it in rice but decided to give it a go and I loved it. Thanks and enjoy the coming week! You did a basmati makeover! I can totally see the other ingredients used commonly with basmati but Parmesan!… Wow.. Must have tasted divine and smelled so so good :). It tasted really nice. I would do it all over again. I wish you a pleasant week ahead! I like these understated recipes that depend on a few good, healthy, fresh ingredients. Now, if I would just learn to cook . . . Thank you. I hope you’re enjoying the weekend! Yummy! Since my teen years fending for myself in the kitchen, basmati rice with parmesan has been a quick & easy staple with a nice punch of flavour. This looks like a delicious twist. 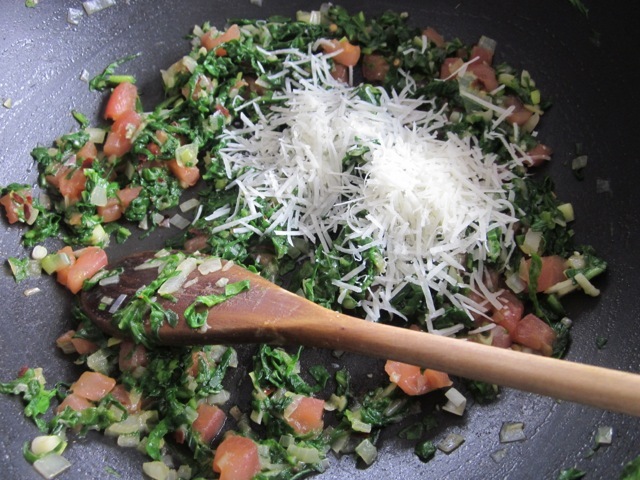 Oh yes, the addition of spinach or Swiss chard, is a wonderful addition to the Parmesan. I loved it! I’ve been looking for some new rice recipes. I love rice in the summer as a side dish to whatever comes off the grill. This looks great! Thank you very much. I enjoyed eating the spinach rice! Have a wonderful day!